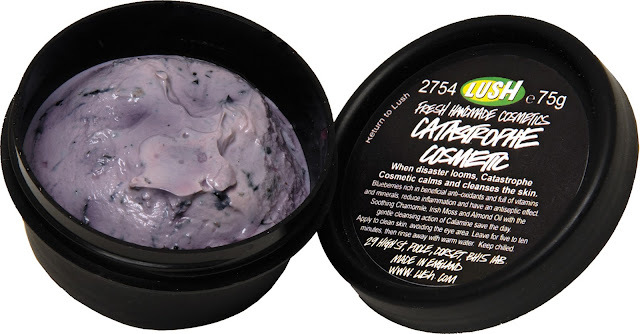 I picked up a sample of one of Lush's fresh masks - Catastrophe Cosmetic a full pot costs £5.75 for 75g but they give away samples with no hassle so its always nice to try before you buy, especially when it comes to skin care because you don't want anything to make it worse! 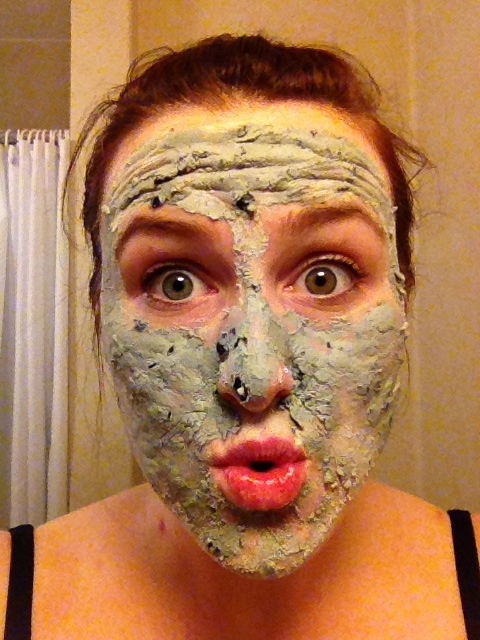 With the Lush fresh masks you need to keep them in the fridge and use them up within two weeks. Fresh Blueberries - full of vitamins, minerals and antioxidants. I put this in the fridge when I got home then took it out before I was going to use it, it was very cooling when it went onto the skin and has an pleasant blueberry- rose smell. It has little bits of blueberry in it so that makes it a bit hard to smooth onto the skin easily, I used my hands for this. I didn't find it really easy but then again this is the first real face mask I've ever tried so I really do need to compare it to others. I left it on for about 15 mins and it went hard and began to flake off so I had to stand over my sink to not cause any mess! A gorgeous photo of the mask in action.. I have to be honest and say I didn't notice any difference. My skin did feel a bit softer but I didn't see a reduction in redness, or my spots. Maybe this would only be the case with continued use and the sample is only enough for 1 time. Overall I am happy I tried it but glad I didn't pay for it, however this does make me very open to try some other of Lush's mask such as Mask Of Magnaminty which is also aim specifically for people with spots. My problem is I don't have oily skin, but I do suffer from break out so its difficult to find products that dont just end up drying my whole face out..
That looks (excuse the pun) lush, I actually feel like eating it! Haha.